It is widely accepted that Meissen is the home of European porcelain. What is less widely known is the bizarre story of its birth. During the latter years of the 17th century, alchemy and science seemed intertwined in a heady mix of greed, witchcraft, charlatanism and philosophy - and pivotal to the story of Meissen is a gentleman called Johann Friedrich Bottger. Bottger was able to publically demonstrate his abilities to produce gold from base metal, a skill that bought him to the attention of Friedrich I of Prussia. Fredrich I was a new and somewhat spendthrift monarch who had recently lavished a huge sum on his own coronation – in consequence rather short of cash and keen to get his hands on a pile of 'free' gold. Needless to say, Bottger panicked and fled to neighbouring Saxony; not least because Friedrich had a habit of using torture to get speedily to the nub of a problem. Out of the frying pan and into the fire, Bottger ended up in the hands of Augustus the Strong, another king who as a result of several costly wars could also find a use for an endless supply of gold! 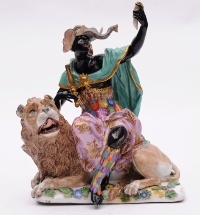 A Meissen figure of Africa, circa 1745. In 1701, he was spirited away and imprisoned in Dresden Castle, given a laboratory and told to get to work. Not only did Bottger not produce gold, although he remained convinced that he could, he foolishly tried to escape – an act that nearly cost him his life. Thankfully, Augustus had another love in life. Along with many other European monarchs, he coveted costly Oriental porcelain and had amassed a significant collection, so in an act of mercy, Bottger's skills were turned to discovering the secret of porcelain. He was given much assistance and eventually, in 1708, he succeeded in producing the first prototype hard paste porcelain, not dissimilar to the so called Yixing red wares from China. This 'new' and profitable discovery of porcelain on European shores was a secret that Augustus worked very hard to keep exclusively for his benefit. 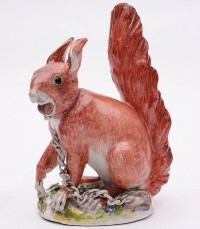 A Meissen squirrel, circa 1750. 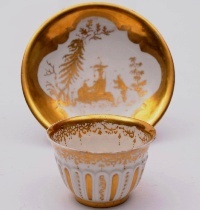 Initial production was for smaller items of tea and table wares, made more luxurious by the application of gold leaf - at this early stage gold was also quite useful for covering flaws in the body. Augustus did crave the big and ostentatious porcelain vases and jars that he could get from China, but his craftsmen were as yet unable to produce them without disastrous results. However, when Meissen took on a sculptor, they were able to produce porcelain figures, something that as yet had not come from China in any numbers. Whilst much early porcelain production had an Oriental flavour, the emergence of figures modelled at the hands of Johann Kaendler, Peter Reinecke and Michel Victor Acier (amongst many others) heralded the 'true' birth of European porcelain, with subject matter rapidly expanding into animals and birds, Italian Comedy, Street Traders, Courtly Life and Mythology, all thoroughly domestic in subject matter rather than mimicking the Oriental.